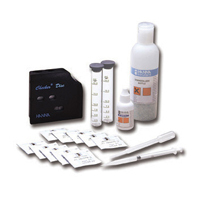 Hanna Instruments silica dual range test kit HI98067. This kit tests for silica in the range 0-40 mg/L in 1 mg/L steps and 0-800 mg/L in 40 mg/L steps. The kit has 100 tests total.